Thanks to Spikes wonderful Grandparents, Mark and I got a week in San Francisco on our own. My flights were booked in the New Years Sale, and Marks slightly later due to him travelling over early for a training course that wasn’t confirmed until February. We flew with Air New Zealand in economy class. We paid with our OneSmart cards to save on fees, because we didn’t have enough AirPoints Dollars to buy a ticket with those. My flight out of Auckland sat on the tarmac for 2 hours before pushing back due to an issue, but my seat mates were awesome. On our flight home, despite calling AirNZ and confirming we would be seated together, there was no empty seat next to me when Mark was upgraded to Business Class with his Silver status. That was a rough flight. 1. 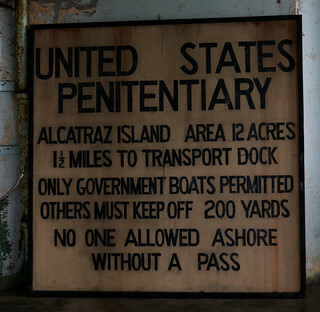 Alcatraz – book early. Way early. On-the-day bookings are rare as hens teeth, and night tours sell out weeks in advance. Don’t bother taking much food, you can only have water once you are off the wharf. I recommend booking either one of the first boats of the day (and come back for a late lunch) or a lunchtime boat (and have an early lunch before you go). Note that the items in the gift store are only available on the island. If you like it, buy it. 2. 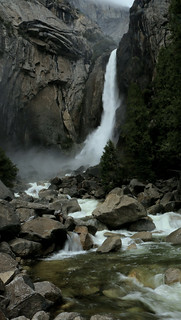 Yosemite – seriously, worth a trip on its own. I need to go back one day. A one day tour out of San Francisco sees you only spending a couple of hours in the valley itself, after four hours on a bus each way. Having a tour guide who can pick out climbers on El Capitan is a big advantage to the tour though. 3. California Academy of Sciences – This is a stunningly gorgeous interactive museum space. I spent my whole time there thinking “LJ would LOVE this” and wishing we had him with us. Start your visit after lunch and visit on a weekday. We arrived at 1pm and found school groups just about preparing to leave, then it got quieter as the afternoon went on till we left at 5pm. Alternatively, check out their Adults Only evening. 4. Ride the Golden Gate Bridge – Another awesome experience, and some fun exercise. We picked up bikes from the “basically free” hire shop, and took advantage of their value-match voucher for the outdoor store on the way to the bridge to get some new sunglasses for Mark. If you want to ride back (rather than catch the Sausalito Ferry), I recommend turning around at the lookout immediately across the bridge. Its quite a drop down to Sausalito. 5. Exploratorium – SO MUCH FUN. Another one to definitely take kids to. Timing works best in the afternoon or the Adults Only evening if you have no kids. We spent almost the entire day there, and loved it. Its only drawback is there are very few food options around the immediate area, although you do get a pass out. As a Coeliac, eating is always something that causes trepidation when travelling. I hate seeming pick y. This trip, I opted to be careful rather than pedantic, and actually had no significant issues, thankfully. 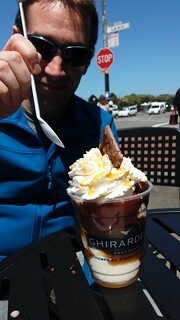 Also, visit Ghiradhelli Square and share a sundae. They are huge. We split one between two and didn’t really need dinner that night. San Francisco has SO MANY transport options. Like any major city, sometimes the real-time is wrong, which can be frustrating, but by and large we got to where we wanted in a suitable time frame. We used every single transport option the city offered – Bart, Muni, streetcar, bus, trolleybus and cable car. Buy a City Pass if you are around for a few days and wanting to do the included attractions (you get the best value from this by buying it on your first day at the Alcatraz check-in, but make sure you take cash if you want to do this as they don’t take international cards). We well and truly got our value out of this with the number of hop-on-hop-off cable car trips we did (at a usual cost of $7/adult). The best way to get on the cable car is from the Fishermans wharf side. The lines are shorter and you’ll tend to get on faster. The Market St turnaround is always busy except late in the evening, and although you can sometimes have luck trying to get on at O’Farrell Street or Union Square, it can also be impossible. Don’t rely on a cable car ride to get you somewhere if you have time restrictions. Obviously, the Cable Car is an iconic attraction you have to try though. Ride the sideboard. I’m not going to spruik the place we stayed. It was a hostel because we booked so late nothing else was in our price range. We paid $150NZ/night for a private room where the bed was basically wooden, on the edge of a dodgy area of town. Being on the Market St side of Union Square, it was also a LONG way from most of the tourist areas and there were no decent supermarkets nearby. We spent a lot of time getting to and from Fishermans Wharf. Its only advantage was on our Yosemite day – we were all but last on and first off. Our surprise awesome experience was the half day Whale Watching tour we did. Right on the key season for Humpback migrations, we saw at least half a dozen whales, and a megapod of approximately 200 common dolphins. Definitely season-dependent. May is a great time to do this. Overall, while we had a good time, and enjoyed the opportunity to have a break by ourselves, we aren’t sure we would go back for another holiday here. We would go back to take Spike to CalSci and the Exploratorium, and I would love to do some more photography around the place, or walk the length of the botanic gardens. Perhaps we’ll add it as a stopover if we are in the area again. Totalling up what we spent on our credit card and on cash, we spent just over $8,000NZ for 8 days – including flights, food, accommodation, activities, transport, souvenirs and travel insurance. $3,000 of that was the flights. San Francisco is a really expensive place to visit!